When the Christmas season is upon us, the Victorian city of Manistee kicks off the festivities in a big way, with its annual Victorian Sleighbell Parade & Old Christmas Weekend. This popular event brings as many as 10,000 visitors to Manistee to experience the wonder of a Christmas gone by. The highlight of the parade is the Belgian draft horses that pulls a 30' Christmas tree down River Street in downtown Manistee. The entire Old Christmas Weekend is filled with wonderful activities. -The Festival of Trees (Friday 1-8pm, Saturday 9:30am-8pm, Sunday 11am-1pm. -Guided tours of Dempsey Mansion every day at 1,2 & 3pm. -The Glenn and Pat Lottie Art Exhibit at the Ramsdell Theatre (Thursday & Friday 10am-5pm, Saturday 1-8pm, Sunday 11am-4pm). A Victorian Christmas at the Manistee County Historical Museum (Thursday 10am-5pm, Friday & Saturday 10am-7pm, Sunday 10am-2pm). "The Nutcracker Ballet," at the Ramsdell Theatre (Friday & Saturday at 8pm, Sunday at 2pm). Manistee is a great place to pick up those gifts for everyone on your list, and downtown restaurants welcome you into their cozy establishments for a delicious meal. 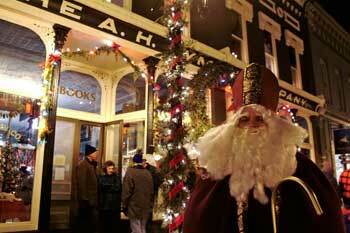 As the snow flies, enjoy the carolers, decked out in period dresses, coats, and top hats. It's certainly the right setting to put you in a festive holiday mood. 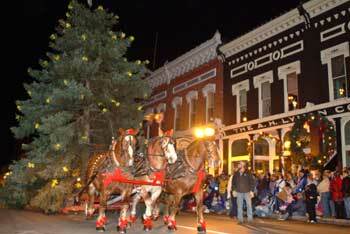 The main feature of the Old Christmas Weekend is the Victorian Sleighbell Parade at 5:30pm on Saturday. Get downtown early to enjoy hot cider at 4pm and roasted chestnuts at 4:30. It's also your chance to get a look at the Kiwanis Cops that mingle downtown. The Sleighbell Parade, complete with horse-drawn Christmas tree, is filled with the old-fashioned nostalgia of Christmases gone by. It's truly a don't miss highlight of the holiday season to share with family and friends. For the holiday season, make sure you include Manistee's Victorian Sleighbell Parade & Old Christmas Weekend in your plans. 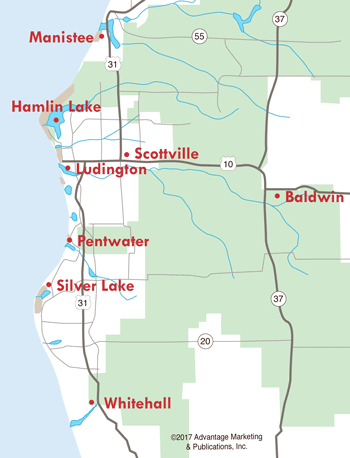 If you are traveling from outside the area, check out Manistee lodging facilities for a great place to stay, and Manistee restaurants for your dining options. Christmas Cookie & Wine Pairing, 12pm-5pm, Douglas Valley Downtown, 431 River St.
Chamber Business After Hours, 5:30pm-7:30pm, Ramsdell Theatre Ballroom. Ashton Cigar Holiday Experience, 12pm-4pm, Surroundings. Kids & Kupcakes, 6:30-7:45pm, Ramsdell Theatre. Downtown Soup Cook-Off, 4:30-6:30pm, downtown Manistee. Jingle Bell Jog 5k run/walk, 10am, Kennedy Elementary School. Sleighbell Bazaar and Craft Show, 9am-4pm, Manistee High School. Vogue Theatre Free Christmas Classic Movies, 10am-5pm, Vogue Theatre. Parents & Paint, 10am-noon, Ramsdell Theatre Ballroom Balcony. The Old Kirke Museum, 11am-2pm, 304 Walnut St.
Love for Children & Chocolate, 11am-5pm, Christian Faith Church International, 55 Division St.
Meet the Grinch, 12-1pm, Happy Owl Bookshop. Christmas Cookie & Wine Pairing, 12-5pm, Douglas Valley. Carriage Rides down River Street, 12pm-3:30pm. Historic Tour of St. Paul's Lutheran Church, 12pm-2pm. Canvas & Cheer, 1-3pm, Ramsdell Theatre Ballroom Balcony. Santa's Headquarters, 1-3:45pm, Manistee Municipal Marina. Pony Rides, 2pm-4pm, Manistee Marina. Christmas at the Buckley House, 2-4pm, 450 Cedar St.
Maxwell Town Brass, 2:30-3:30pm, 390 River Street. Christmas at Moving Spirits, 3pm-5pm, 429 River St.
Roasted Chestnuts, 4:30pm-7:30pm, River Street. Merry Trombones, 4-5:15pm, 390 River Street. Jingle Mingle 4:30pm-7:30pm, Ramsdell Inn. 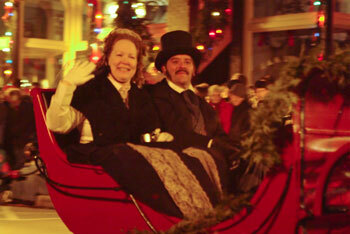 Victorian Sleighbell parade, 5:30pm, River Street. Caroling & luminaries follow. Traditional Swedish Brunch and Worship Service, 10am, Portage Lake Bible Camp. Christmas Cookie & Wine Pairing, 12-4pm, Douglas Valley. Santa's Headquarters, 1-4pm, Manistee Municipal Marina. Lessons & Carols, 3pm, Trinity Lutheran Church. Enjoy the holidays in Manistee, Michigan! Starting to decorate for the holidays? It's a great time to find a Fresh Christmas Tree for your home!